Freeing your soul from all the negative stuff in your life is an exhilarating experience. It’s amazing what a positive mindset can do! God has forgiven us for our sins, and now it’s time that you start forgiving yourself. It’s time to change your thought process and learn how to enjoy the destiny God has created for you. In your life journey, challenges and mistakes are going to happen, but you need to realize how those issues are simply the stepping stones to the “good life”. This book will not only teach you how to overcome obstacles, but to renovate your soul. When you are finished, you will have the tools to give your mind, body and spirit a complete overhaul. It’s time to make better choices. It’s time to live that wonderful life you dream of. It’s time you focus on the YOU that God intended you to be. 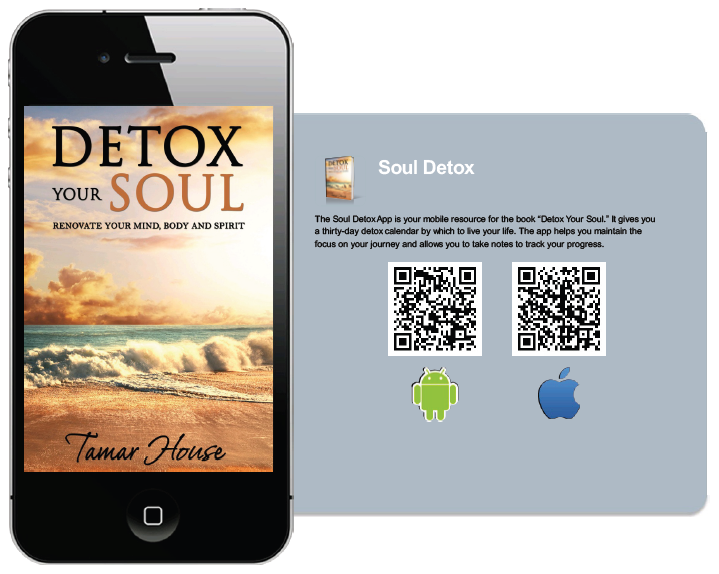 It’s time to DETOX YOUR SOUL!!! I'm a life coach, and am ready and willing to help you detox your soul. Let me help you turn your dreams into a reality! Whether you are a high-powered executive searching for work-life balance, or an empty-nester looking to find more substance in your life, I am ready to help you achieve your goals. If you are determined to make your life better and live the life God intends for you, contact me today! Copyright © Tamar House, 2013-14.